Black Ash slices for purchase, these are sanded, but not sealed. 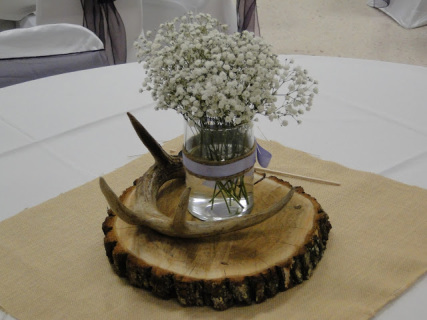 They make great Table centerpieces, and /or Cake plates, and can also be used for signs. Prices vary from $8.50 to 10.50 each, + 13% hst. You can also paint them. Call to pre-order. We need time to allow wood slices to dry. Head Table centrepieces for Rent. This is a custom-made Head Table centrepiece, approximately 10 feet long, mostly white and lavender, but can be made in most colours. Must be ordered ahead of event. Prices vary from $250.00 up to $500.00, +13% hst.